Wickliffe Simmons appeared on Show 270, recorded in March 2013, at age 19. Wickliffe Simmons (cello), 19, is a senior at Holy InnocentsÕ Episcopal School in Atlanta, Georgia. He is a student of Hans Jensen. 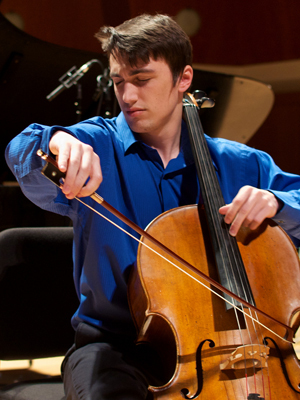 A member of the Atlanta Symphony Youth Orchestra, he has also participated in the Heifetz International Music Institute, the Bowdoin International Music Festival, and has soloed with the Georgia Philharmonic Orchestra. Wickliffe enjoys traveling and meeting new people.